Chemainus is an arts and cultural destination, plan your visit to our world famous village its outdoor mural art gallery, professional year round theatre, antique shops, golf, diving, nature and more. Each year, thousands of visitors from all over the world travel to take in this unique village with its rich historic past. Chemainus, has things like imagination and foresight and a will to survive after it was announced in 1982 that the major employer in this one industry town, the mill was going to close in 1983.
without waiting to hear if the mill would reopen, residents rallied to hold on to the roots they had established here. They beautified the central core and the Festival of Murals Society was born. The downtown was revitalized and introduced to outdoor art gallery of murals. The first town to do this and indeed Chemainus became an example to the world as to how grow tourism via the art of murals. You will now see over 40 murals and numerous statues. In 2008 the society expanded its vision from depicting the history of Chemainus and the Chemainus Valley to include the history of Vancouver Island and is now using the images of Emily Carr a group of seven Canadian BC artist. 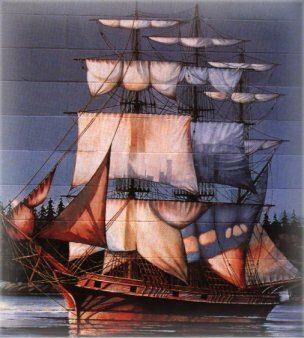 Painted in 1982 by Frank Lewis and Nancy Lagana, Victoria, B.C. Originally from Victoria, B.C., Frank Lewis' career took him eastward in the late 1950's. Soon he was winning acclaim for his work as a professional illustrator, with awards from both Toronto and Montreal. In 1963, his work was placed in the prestigious New York Society of Illustrators Show. Back on the West Coast in the late 1960's, the style of Lewis' painting began to change and evolve on a larger scale, beginning with the decoration of a construction fence at the Vancouver Court House. Soon to come were mural paintings for tourism projects, as well as commissioned works for Daon Corporation, the Carnegie Library, the Westerly Hotel, and other clients. As Lewis' assistant, Nancy Lagana brought with her an impressive academic art background. She has an Honours B.A. from Harvard University, and studied ceramics and sculpture at the Vancouver School of Art. For the steam donkey and it's crew, hauling a log from the forest was an obstacle course of the worst kind, fighting rocks, gullies and stumps every inch of the way. "Charlie", the line horse waited patiently in the background, ready to pull the 20mm cable to the nearest felled log. The steam donkey was invented by John Dolbeer in 1882. This particular one was built by Murray Bros. in San Francisco and started work for the Victoria Lumber and Manufacturing Company in Chemainus in 1885. The painting is based on a photograph from 1902. The man controlling the lever on the steam donkey is Herbert M. Olsen, who was later to become prominent in world-wide lumbering ventures. Now restored, this Dolbeer steam donkey has been retired to the BC Forest Museum in the Cowichan Valley. Our Trompe L'oeil Mural named "Emily's Beloved Trees". 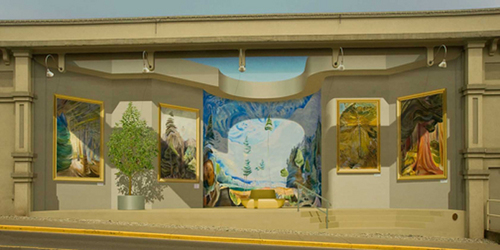 "Emily Carr Trompe L'oeil mural" is "Nova Color". The outdoor mural art gallery and statues is open 24 hours and free of charge.